Here, we note that population growth is weak in the Northeast and much of the Midwest, while it is stronger in the South and the non-California West. Driven by a flight to oil jobs in North Dakota, the growth in ND topped the list with 2.2 percent growth, or 16,800 new residents, which is a lot for a state with fewer than a million people. Colorado gained 100,900 new residents to add to its 5.3 million people in 2014. Meanwhile, New Mexico, Mississippi, Maine, Connecticut, Vermont, Illinois, and West Virginia all lost residents. New York was 16th from the bottom and added only 46,900 residents to its population of more than 19 million. The Wall Street Journal examined these trends in light of future likely changes to the electoral college. These trends will help states like Texas, Florida, and the Western US gain in influence in national politics. However, when it comes to looking at whether or not people are moving from other states to these places, this map can be misleading. In terms of new residents from foreign countries, Massachusetts tops the list with nearly one in one hundred Massachusetts residents having lived in a foreign country just one year ago. Washington State is close behind, and we can note that Texas, California, Florida, and Virginia growth rates are all fairly dependent on in-migration from outside the US. Will new immigrants from foreign countries stay put in their initial state of residence? This map suggests that, at least for first generation immigrants, they will. There are many reasons for this, including the fact that the foreign born often like to stay near communities that include other foreign born residents. By the second generation, however, the incentives to stay near immigrant enclaves gives way to incentives to migrate to states with freer economies and more economic opportunities. If we look just at in-migration from other states (again, from September 2015), we find that California, New York, Texas, New Jersey, Pennsylvania, Illinois, and the Great Lakes area in general have attracted relatively few migrants from other states. In some areas, much of this has been driven by a boom in oil jobs, and workers have relocated to states that offer the relatively-high wages that oil-extraction jobs offer. In North Dakota, for example, more than 5.3 percent of the population lived in a different state a year earlier. 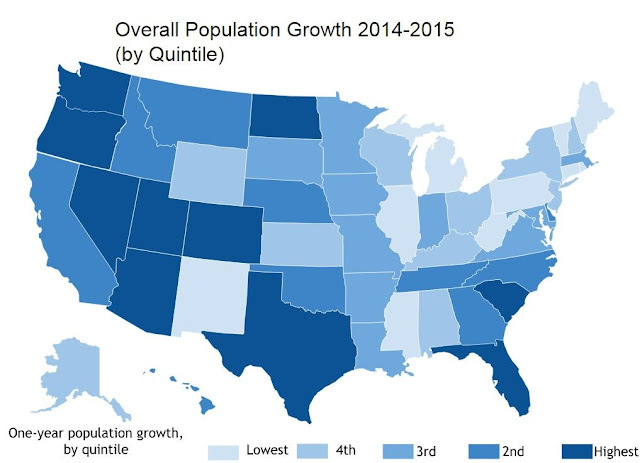 Alaska was similar with a rate of 5.2 percent coming from out of state over the past year. Idaho, Hawaii, Nevada, Wyoming, and Colorado all also showed more than 4 percent of their populations coming from other states over the past year. In California and New York, however, only 1.3 percent of residents had recently arrived from out of state. In Texas, 2.0 percent had recently arrived. This also follows a longer trend in which Americans have been moving from the old population core of the Midwest and Northwest, and been moving South and West.